The iEQ30 Pro EQ GoTo Mount from iOptron features a motorized equatorial mount, the Go2Nova 8407+ computer hand controller, a 2" stainless steel adjustable tripod and a Polar axis scope for faster alignment and set-up. Employing the larger tripod offers increased stability with reduced vibrations versus smaller tripods making the viewing experience more satisfying. 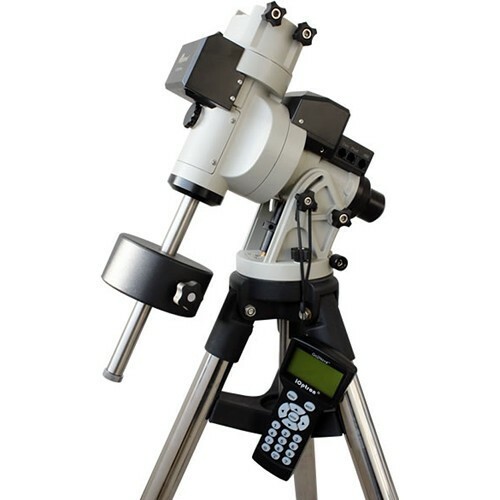 The mount has a Vixen style dovetail saddle for mounting compatible telescope OTAs and accessories of up to 30 pounds. Its built-in 32-channel GPS receiver sends your location and time to the Go2Nova hand controller for a more accurate and faster set up and alignment.